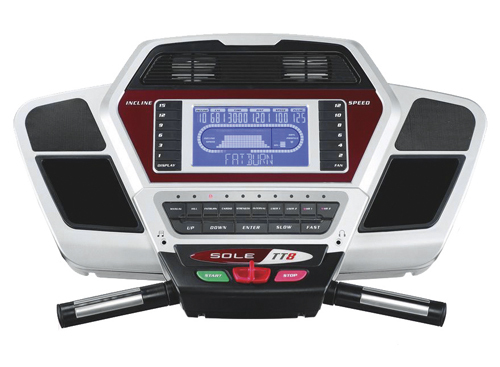 Sole Fitness TT8 Cushion Flex Whisper Deck Treadmill. We are proud and excited to offer the TT8 series treadmill. TT stands for twenty-two as in twenty-two inches wide. The TT8 treadmill offers a twenty-two inch wide running surface designed to give our customers an extra safe and comfortable feel. All Sole orders are delivered to the curb, but it is "driver assist". The driver will assist the customer in getting the item off the truck, it's the customers responsibility to bring the item into the house and assemble. We back every Sole Fitness prodcut that we sell with our 100% money back guarantee. If you have any questions please call us at (701)223-9936 or Toll Free (800)355-2956. If you're looking for a 22" wide treadmill and you want all the options a treadmill can have, the TT8 is your treadmill. The running surface is the largest Sole has at 60" X 22". The TT8 offers a top speed of 12mph and a top incline of 15% to give you a variety of options for interval workouts. We also add our 6 window dot-matrix display, a wisper deck with a lifetime warranty, and a 3.5HP motor with a 21lb. flywheel for smooth and consistant power. The TT8 treadmill has the same great cushion flex deck that other Sole models have to minimize stress to hips, knees and ankles. The TT8 also comes with HRC (heart rate control) complete with a Polar chest strap to keep you on target for heart rate training. The TT8 has every option and upgrade available, it is simply the finest treadmill in the Sole line, backed by the best warranty in the market. Sole Treadmills is excited to offer Cushion Flex Decks, our low impact joint friendly deck design. The Cushion Flex system offers stability for the user while providing minimal stress to hips, knees ankles and spine. The Cushion Flex system was originated back in 1992 and was recognized by a leading university as the industry’s best, providing a 365% lower impact than walking or running on asphalt. Sole does this without compromising any of the stable, safe feel of the treadmill. The Cushion Flex suspension system greatly reduces impact to feet, ankles, knees, hips and spine. This reduction in impact is an outstanding benefit to users with running and walking related injuries and has proven highly effective in therapeutic applications. Sole’s all-steel welded frame design and Cushion Flex suspensions system provide the softest, safest and most stable running surface available. Individuals of all ages who are serious about fitness will appreciate the advantage offered by Sole’s Cushion Flex treadmills. Cushion Flex is a controlled low impact design with the deck, frame and incline system all working together. Most Sole treadmills come complete with Heart Rate controlled workout options to individualize the workout specifically to your needs. This option shows the persons heart rate on the console and the treadmill will adjust incline to keep the heart rate at a determined level. Professional athletes have long known the aerobic benefits of training at a specific heart rate; Sole gives this same option to everyone. Sole treadmills come complete with the heart rate electronics in the console, and a Polar chest strap for the user. The wireless control is 99.9% accurate, as good as an electrocardiogram. Our tri-color electronics come standard on most of our treadmills. We break up your information on the display into three colors, Red, Gold and Green. This makes all of your workout information very easy to understand and separates the information into better detail. Tri-color electronics also allow us to offer more features, with our Heart Rate percentage profile we can define your heart rate into three categories with matching color. Gold, for below optimum, green, for optimum level, and red, for too high, all of this information in real time to keep you at your best heart rate level. All Sole treadmills feature the heaviest duty chassis and motors in their class. Beginning with powder coated all-steel welded frames and heavy duty stable inclines, we add industrial quality motors with large diameter, all-steel zinc coated balanced flywheels for a vibration-free secure running/walking surface. Why do we add a flywheel to our motors? Flywheels cause the motor to run cooler with less amp draw and extend the life off the motor. They also allow us to offer a start speed of .1mph or 1/10 of 1mph. that is super slow and allows very easy and smooth starts. All of this can be done while standing on the belt. How many other treadmill companies offer such low start motors with flywheels for extended life all with a great warranty at this price. None! When we chose our rollers for our treadmill line we went with only the best and outfitted all of our treadmill with the same high-end rollers that most people only offer on $5000 treadmills. We use 2.75” rollers with a sealed bearing design and copper ground wires for each roller to reduce static. Larger rollers make for a larger contact surface against the belt and longer roller and belt life. This makes for smooth, quiet, static free motion that will stand the test of time. We use double woven 2-ply belts with four layers on almost all of our treadmills. Two rubber layers over a middle PVC layer with a nylon backing that rolls over the deck and rollers. The rubber provides the durability, the PVC stops the belt from over-stretching and the nylon provides a smooth static free surface to glide over the deck and rollers. Sole pioneered the concept of In Room Fitness by placing high end treadmills in individual guest rooms at some of the best Hotels in the world. The Sole F80 is available in Hilton Hotels, Omni Hotels and Kimpton Group hotels in hundreds of locations throughout the US. This has created huge awareness of our brand and made Sole Treadmills synonymous with the most widely recognized hotels chains. We get calls all the time from people who say …”I am at the Hilton, and I am on your treadmill, tell me more”…. This has been a great success for Sole, and our hotel partners. What makes the Whisper deck so special, that we would offer a Lifetime Warranty on all of our Whisper Decks. It is simple; we go the extra mile and built a deck that is superior to any other on the market. Most deck have a Phenolic coating to make them smooth, quiet and durable. Whisper decks have this same type of technology in the design but through our propriety engineering we make them quieter, smoother and so durable we offer a Lifetime Warranty on our Whisper Decks. No need to flip our decks, if you wear it our, we will replace it free. Limited Warranty: Motor, Lifetime -- Deck, Lifetime -- Frame, Lifetime -- Electronics / Belt / Rollers, 5 years - Labor, 2 years, In-Home service. -- Warranty in a light Commercial setting -- Frame, lifetime -- All parts, 3 years -- Labor 1 year.